"If we take your word for it, it sounds like everything is my fault!" The tenth installment of Rumiko Takahashi's Urusei Yatsura brings episodes 35 through 39 to DVD, adding four more zany adventures to the series. 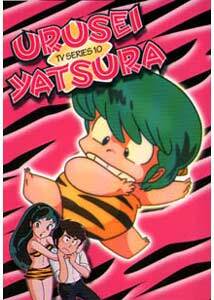 For the uninitiated, Urusei Yatsura tells the story of the world's biggest loser, Ataru Moroboshi, who has unwittingly found himself married to the tiger-striped bikini wearing Lum, a member of the Oni race who were set to invade Earth. Ataru is also an unrelenting pervert, who can't help but chase every girl he sees, despite the fact that none of them want anything to do with him, other than his former girlfriend Shinobu. This behavior causes Lum to exact her punishment for Ataru's unfaithfulness by zapping him with electrical charges. Her cousin JariTen (aka Ten) also delights in blasting Lum's spouse with his fiery breath when Ataru is being an idiot, which is constantly. Lum and Ten aren't the only Oni to visit Earth these days, and Lum finds her hands full with a girl she grew up with on her home planet. Ran was Lum's childhood friend, but harbors extreme resentment for many of Lum's actions as a youngster, and the later exploits of stealing her one true love. The first story here outlines some of Ran's gripes with Lum, which invariably caused Ran to take the fall for Lum's mistakes and wrongdoings. While Ran can put on airs of being a sweet and innocent friend, beneath the façade she is a seething young girl bent on revenge! The mini versions of Lum and Ran here are very cute. The second episode sees the return of the source of Ran's jealousy, Lum's former fiancé Rei, who has a split personality of his own. Ten is once again at the heart of the mischief, summoning Rei to come and play, however, when the monster arrives, study hall becomes a feeding frenzy, as the students try to distract Rei from tearing the place apart the only way they know how—with lunch. Onsen-mark (the teacher) makes his first appearance in this installment. Next, a spectre from the past reemerges as the high school student council plans a disco dance in the school auditorium. Onsen-Mark recalls his youth when the Red Mantle first appeared, terrorizing their school and abducting one of the most beautiful young girls. As the event nears, strange occurrences portend something sinister is about to happen (other than the disco music!). But this phantom menace may be in for a bit of a surprise himself before the evening is through. Finally, Ran is again plotting to steal Lum's "Darling" away from her, and has a willing accomplice in Ataru, who only requires the slightest invitation to sneak out on a date behind Lum's back. Unfortunately, he has just managed to convince Shinobu to go out with him at the same time, so now faces a challenging dilemma. As luck would have it, Ran makes an announcement of her plans to abduct Ataru, putting Lum on guard. She builds herself a replicating gun and duplicates Ataru, the copy finding an apostrophe above his head. With twice the scheming lecher on her hands, the pair manage to elude Lum's vigilance to attend to their respective dates, but Ran has devised her own machine, and before long the town will be up to their eyeballs in Atarus—who will leave no female unscathed! The episodes in this second season have adopted a single theme throughout, usually with a pair of storylines winding together during the duration. Urusei Yatsura's older style animation may not appeal to some, but for those who can appreciate the series' comic brilliance, it doesn't take long to turn one into a Lum-aholic. I have to admit a decided affinity to these characters and the predicaments they find themselves in, and this disc is no exception. Image Transfer Review: Image quality is consistent with the previous releases in this series. Colors are strong, but do tend to bleed in places, and black levels are pretty solid. Being an older show, there are some signs of age, with a few print defects, and some subtle ghosting, but like the last few discs this is the worst in the credits, where it is fairly prominent. Dark blues tend to look grainy, and there are scattered compression side effects present. Still, I'm sure his has never looked better than it does here, and the likelihood it will get better is pretty slim. Audio Transfer Review: Mono Japanese audio is pretty solid, with a minor bit of hiss, and occasional edginess on the dialogue. It serves the show well, and doesn't distract at all. Pretty much equal to past releases in this regard. Extras Review: As has been the case previously, extras are limited to a couple of sheets of liner notes, which provide informative background on some of the show's more subtle details. Translation notes, and cultural references make up most of this disc's content. It is most fitting that the biography for this intallment belong to Ten, Lum's fire-breathing cousin. He may be cute, but he is more like Ataru than he cares to admit. Each episode has internal chapter markers, but only the first is available via the menus. Color me a fanboy, but Urusei Yatsura exudes a classic charm and wit that is hard to beat. There is not a weak episode in this batch, and while they revolve around a common set of circumstances, each comes off fresh, while building on a complex assortment of character relations. Fans of newer shows may find themselves discovering some of the inspiration for their favorites, and the self-contained nature of the show makes it easy to digest single episodes without loss of continuity.